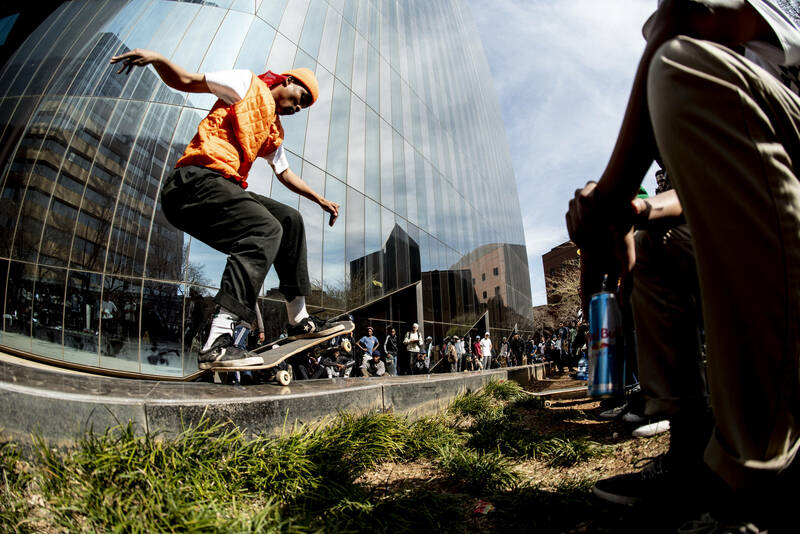 Red Bull ‘Dala The City’ was a skateboarding contest with a difference, instead of individuals, it was all about crews! 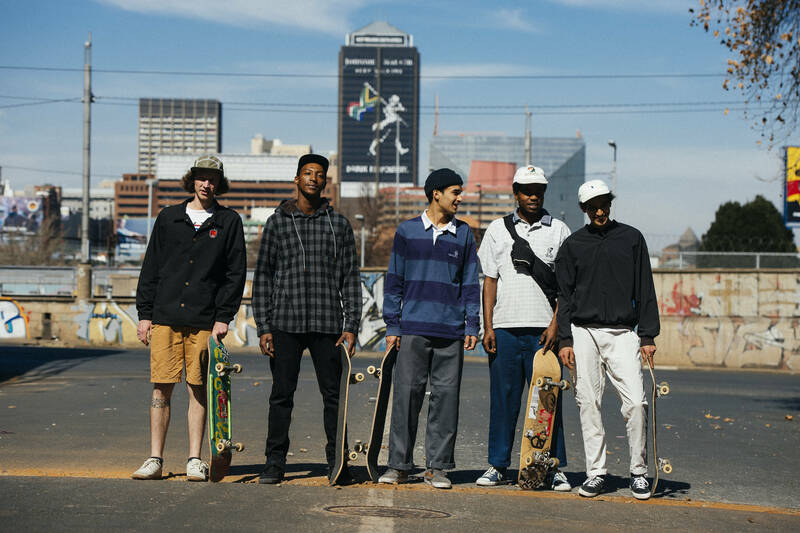 Not just skating against each other, but rolling together on the streets of downtown Johannesburg as one huge posse. 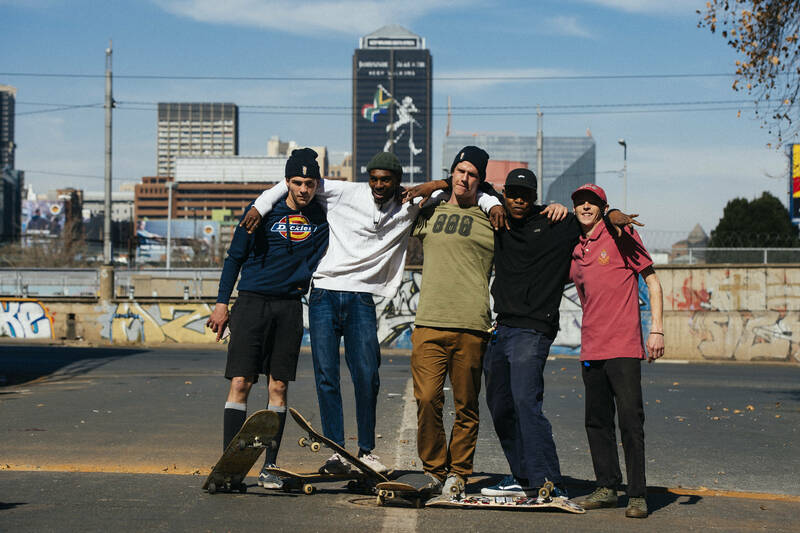 The event created the opportunity for 8 prominent crews to meet one another and hang out on the streets together, an organic skate event that played out in the spaces that JHB crews frequent on a weekly basis. 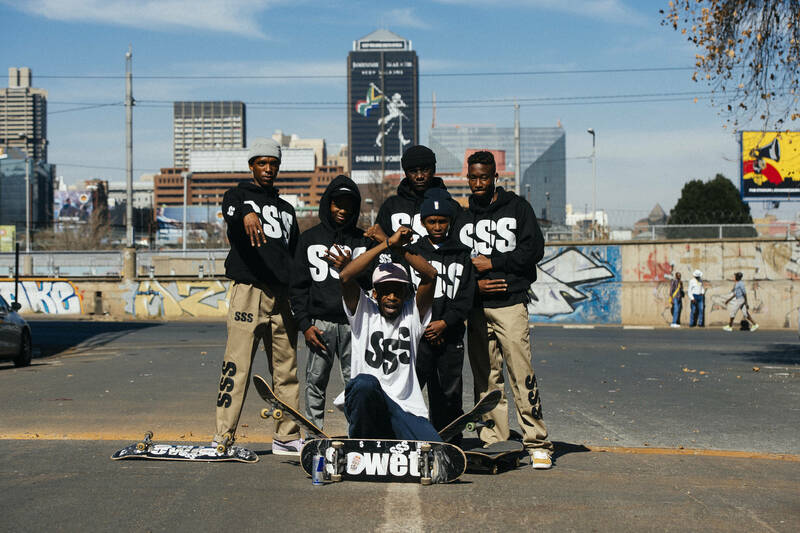 Crews from Cape Town and Durban were flown in to join the 5 JHB crews, plus one that made the short drive over from Pretoria. 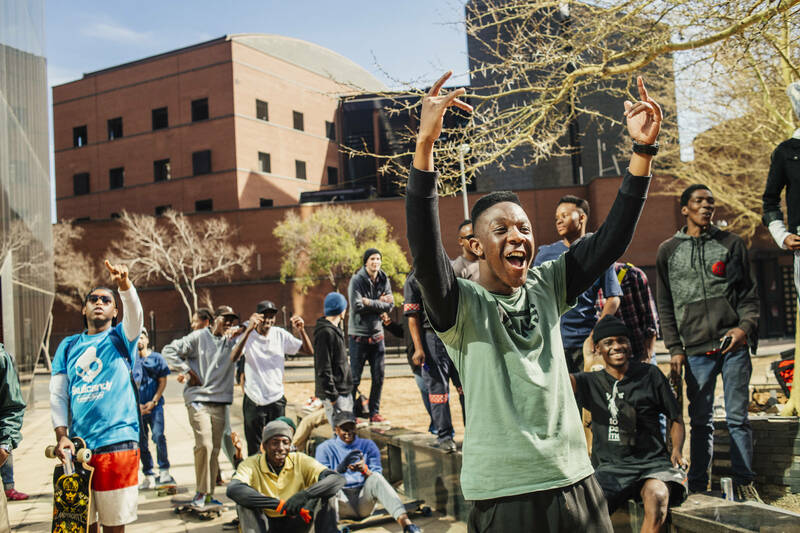 Everybody gathered in Braamfontein on Sunday morning to meet one another and to find out what the plan would be for the day. 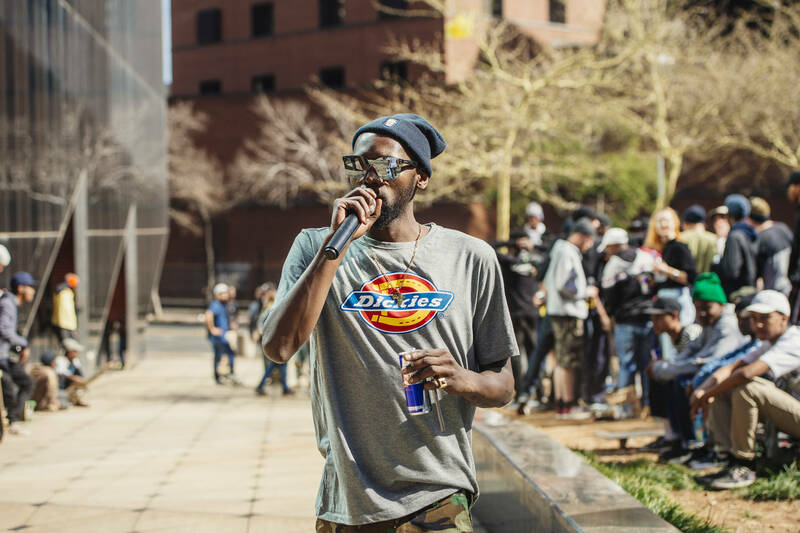 JHB OG Sam Khumalo was the announcer for the day and he let everybody know how things would play out. 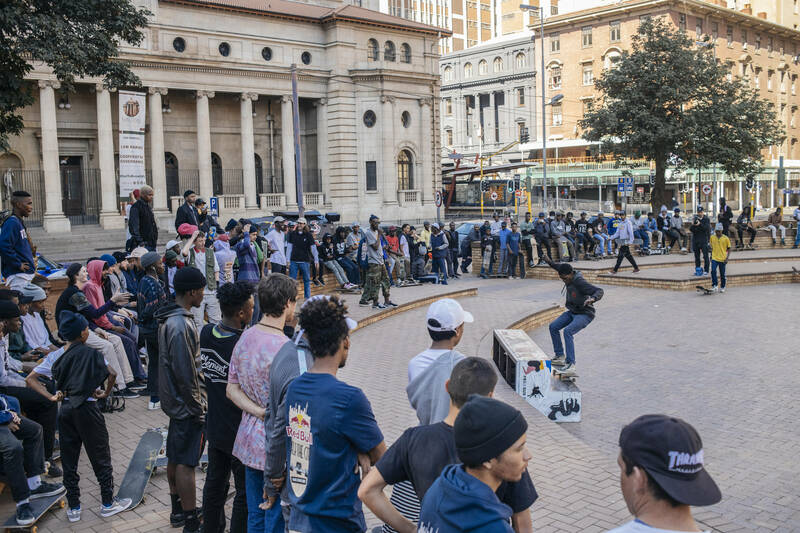 The first spot in Braam was this setup out the front of a building, it was a quick bust, but that didn’t stop Brendan and Levi from VeG Squad getting some quick hits. Everybody then crossed over Mandela bridge into Newtown where the first full heats went down outside the iconic Museum Africa. 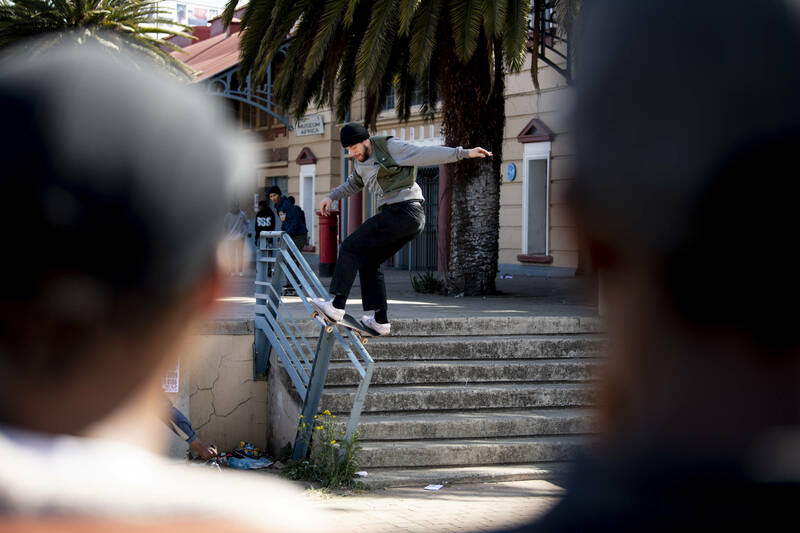 Alex from 20Sk8 banged this switch flip down the stairs. 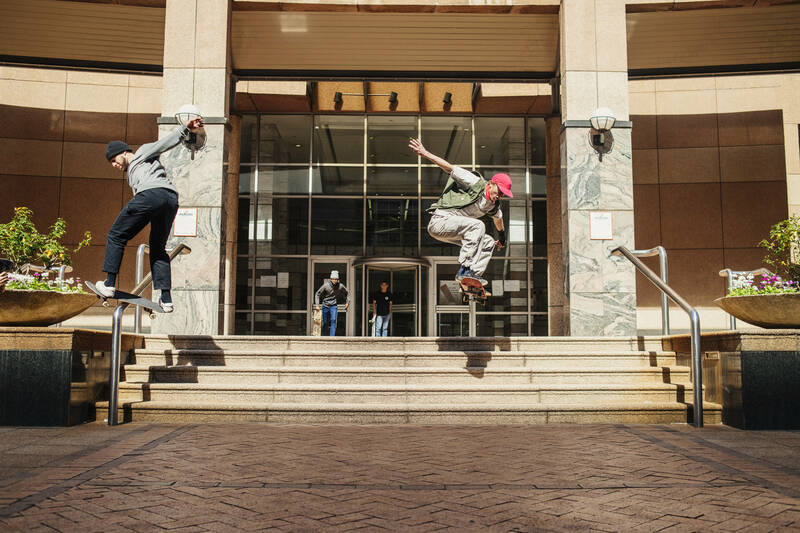 Taylor from WASTED with a lesser-seen airwalk. Brendan from VeG Squad with another quick front board. Trent from Cloudy Bros with a one-footer. 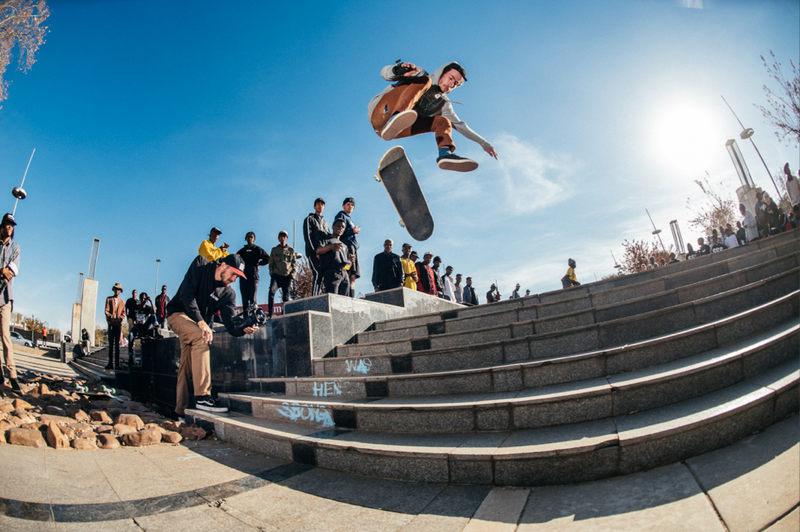 Shaun from Slappy with a nollie hardflip. 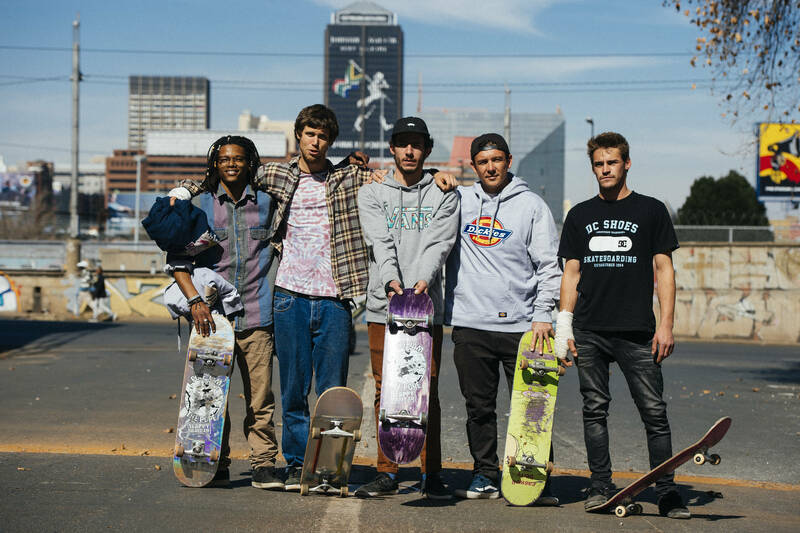 Everybody then made a short ride over to ‘Mirrors’ to skate the long granite ledge. 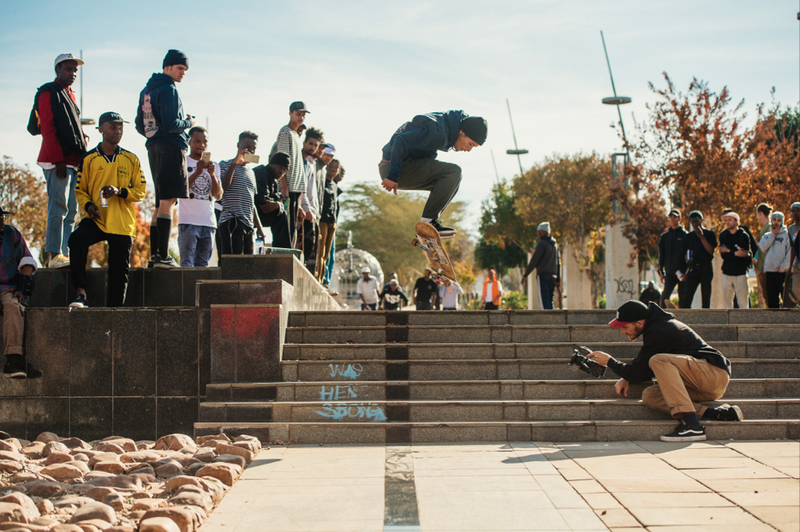 Thariq from Cloudy Bros with a front smith. 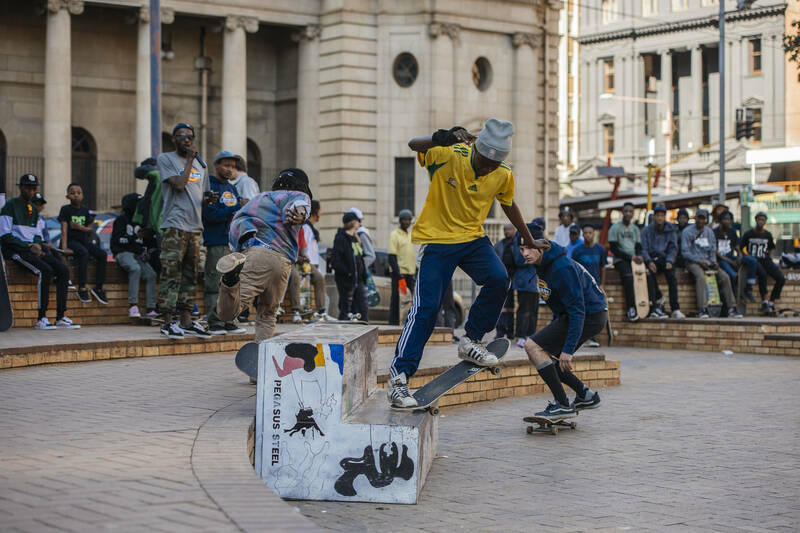 Toufeeq from 20SK8 did a few backtails. 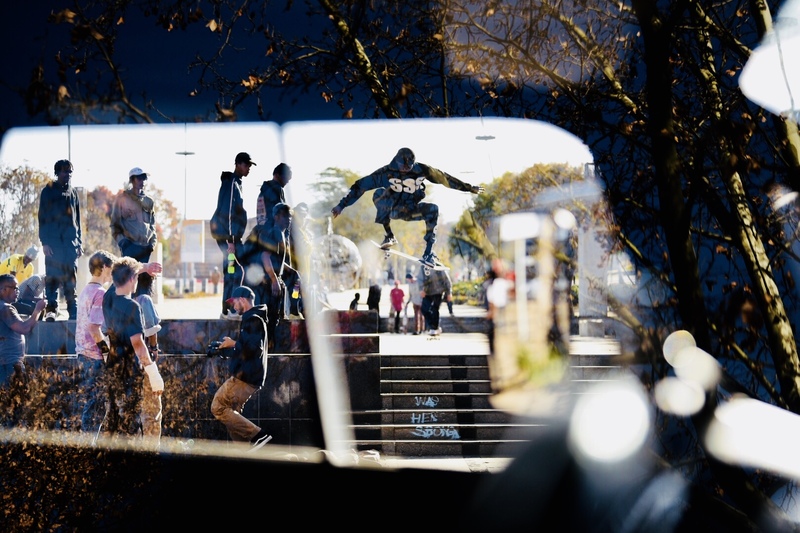 Puddy from Slappy seen tailsliding in the mirror, now you can see why locals call the spot ‘Mirrors’. Sam regulating activities throughout the day. 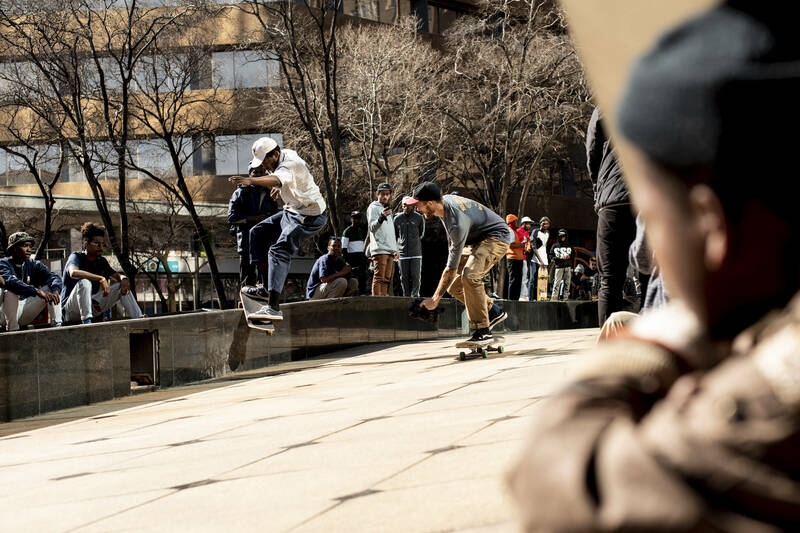 Plenty of JHB locals rolled around alongside the crews, and were hyped on the spectacle in their city. 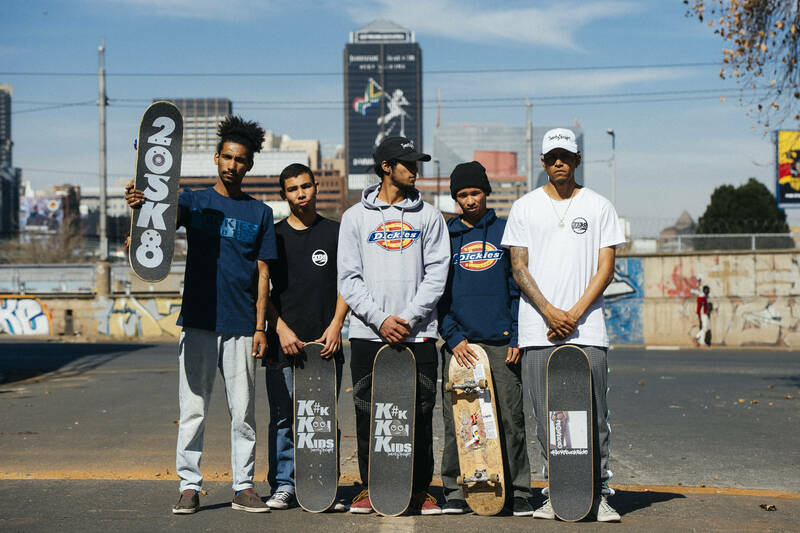 Nkosi from Cloudy Bros with a backsmith. Crews were supporting each other hard! 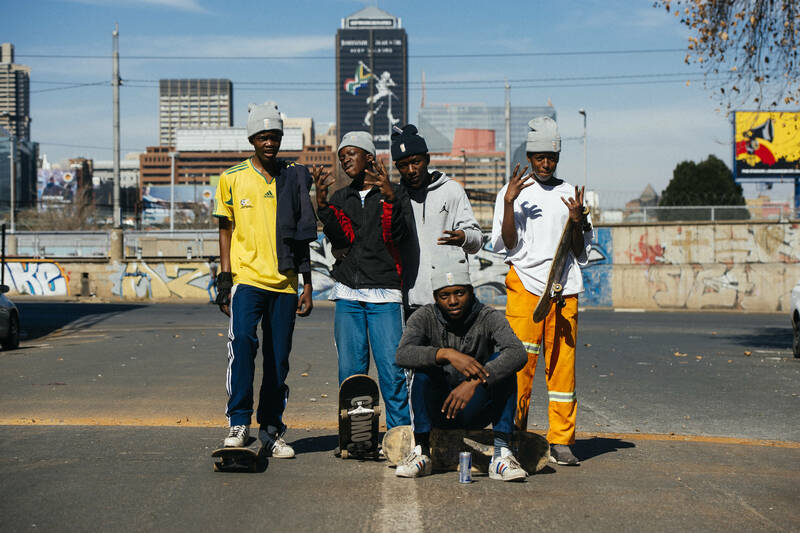 We then headed up the street to the unofficial home of skating in JHB, Library Gardens. 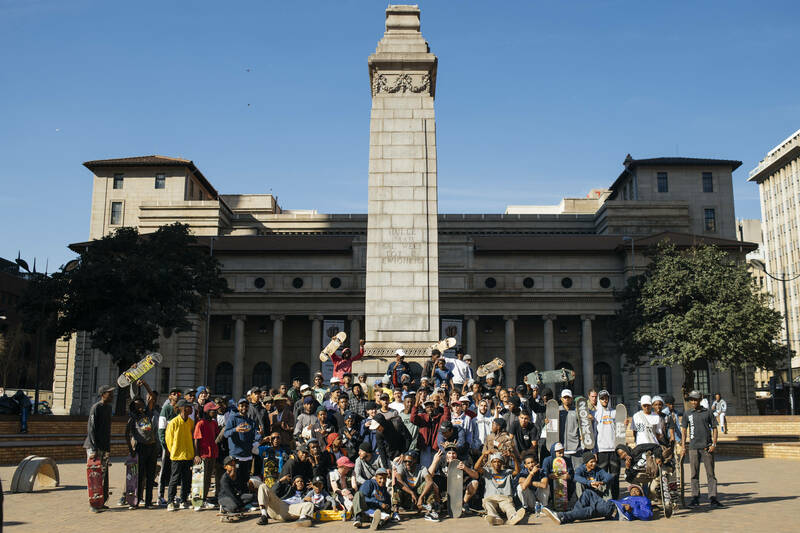 Since the bottom section got fenced off, everybody skates the top section that’s known to skaters as ‘The Monument’. An extra ledge obstacle was brought over from the Drill Hall for the day. Lavender Gang, Slappy and WASTED crew members going head-to-head. 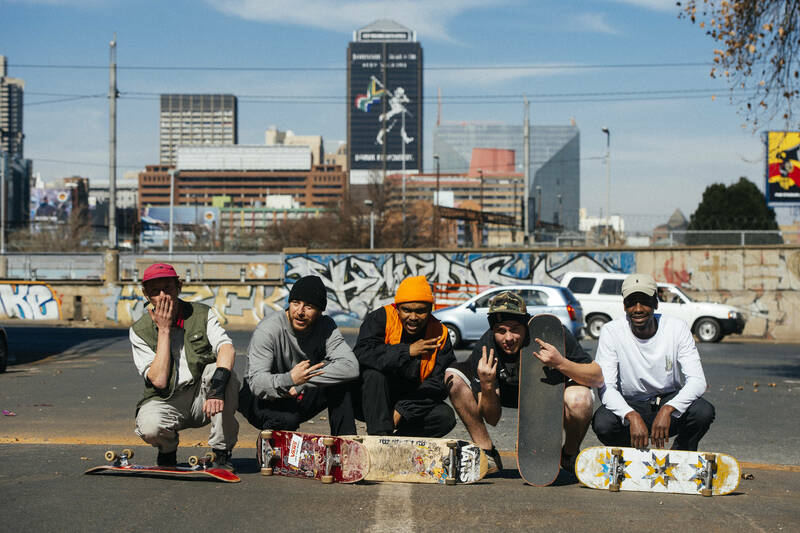 We had to get a group shot at this iconic skate landmark, it may have been a contest on paper, but it was all family on the streets. 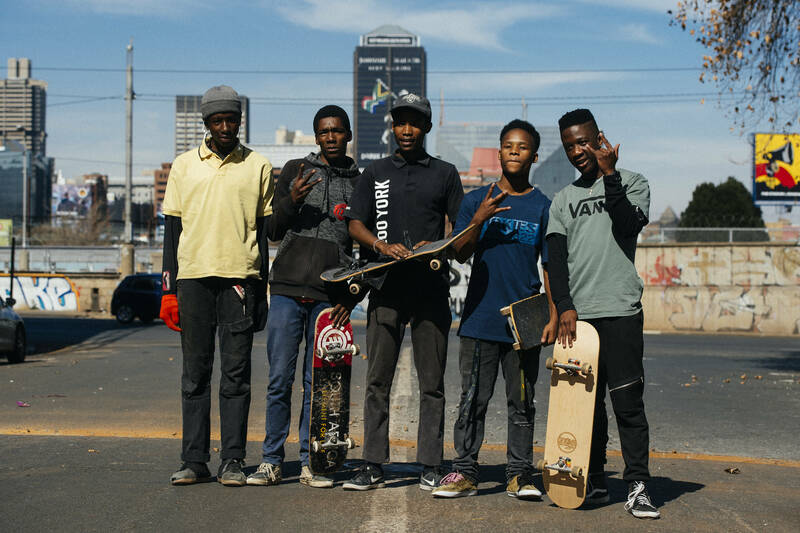 The final stop was all the way across town outside Ellis Park Stadium, Ethan from 20SK8 with a kickflip. Ethan also banged a 360 flip. 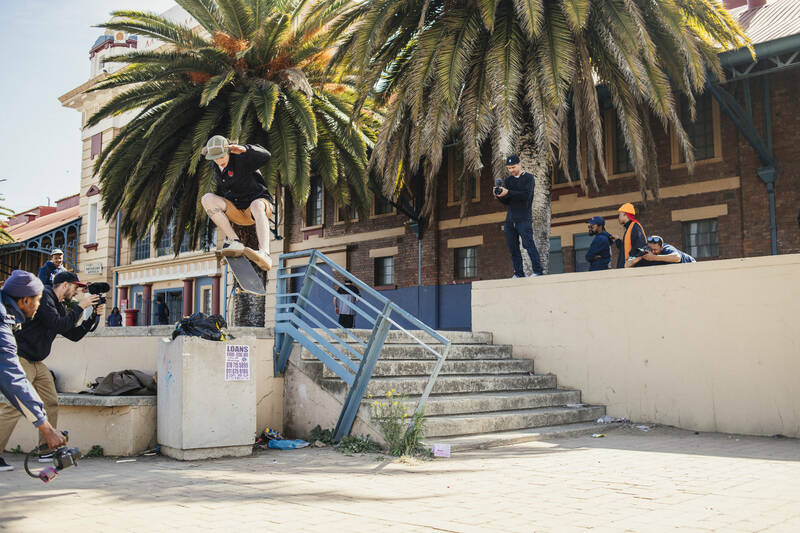 Kyle from SSS with a long 180 off the higher steps above. 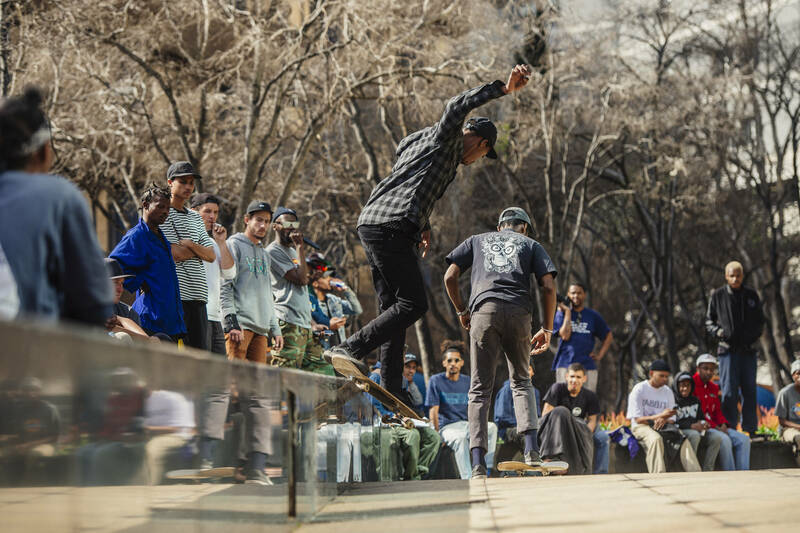 Thariq from Cloudy Bros with a big switch ollie. 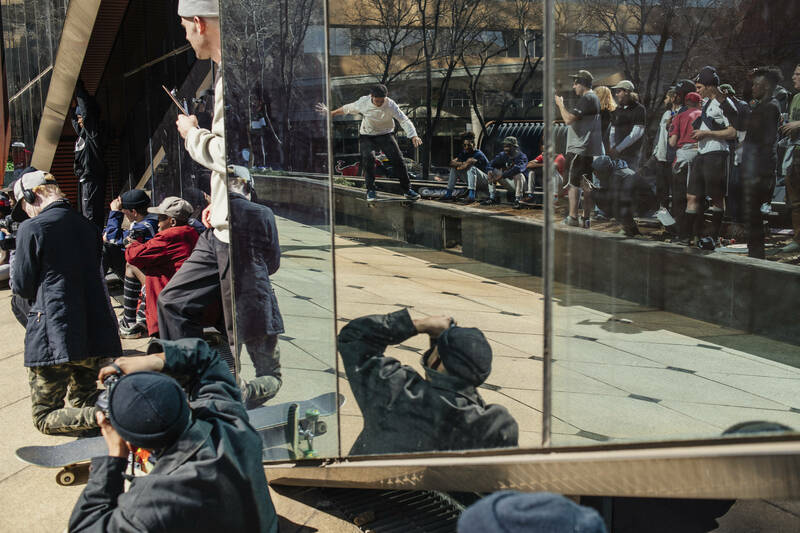 Alex from 20SK8 nollie flips. The results after all the spots were really close! 1st and 2nd were neck-and-neck, and 3rd and fourth were neck-and-neck. 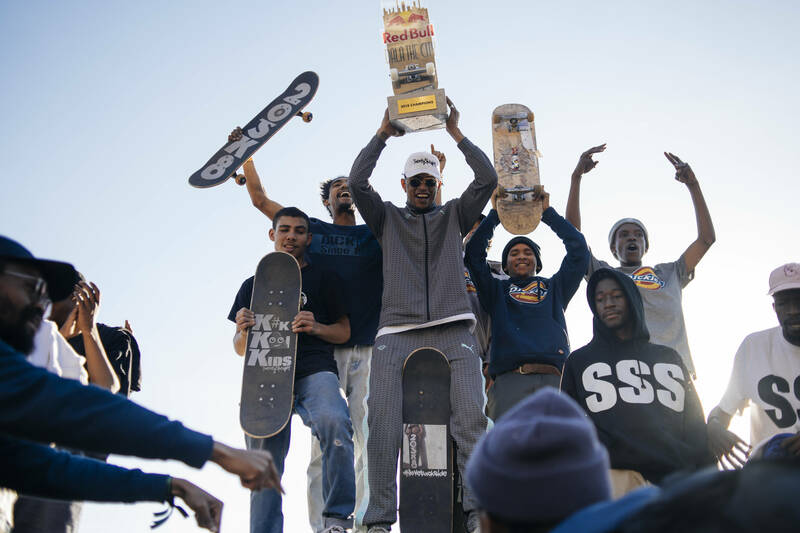 In the end 1st place went to 20SK8, 2nd was SSS and 3rd was WASTED. Slappy just narrowly missed the podium and Cloudy Bros were not far off either. 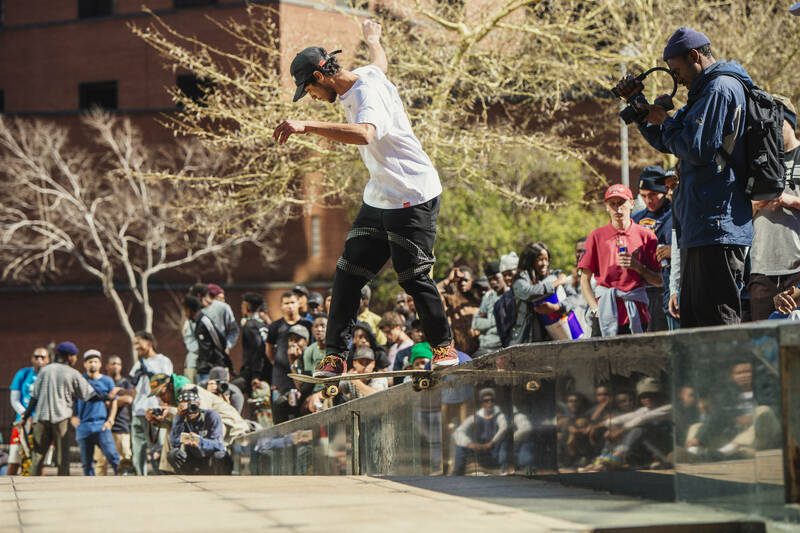 Red Bull ambassador Moses Adams banged this nollie backside bigspin while the judges were working out the final scores. 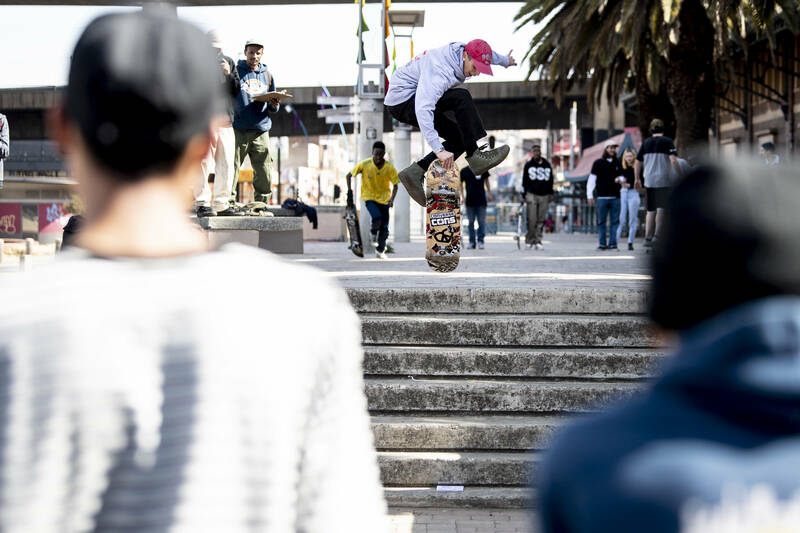 After hitting his head a little earlier, Shaun Burger from Slappy still had enough in him to win the stand alone ‘Best Trick’ contest that followed the crew heats, by rolling away from this switch hardflip. 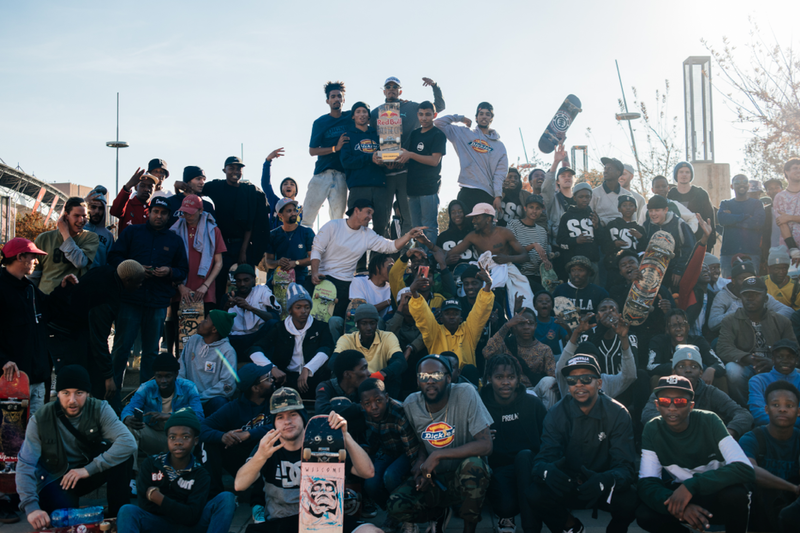 In the end it was all love, and a party spontaneously erupted at the spot. Good times all round! 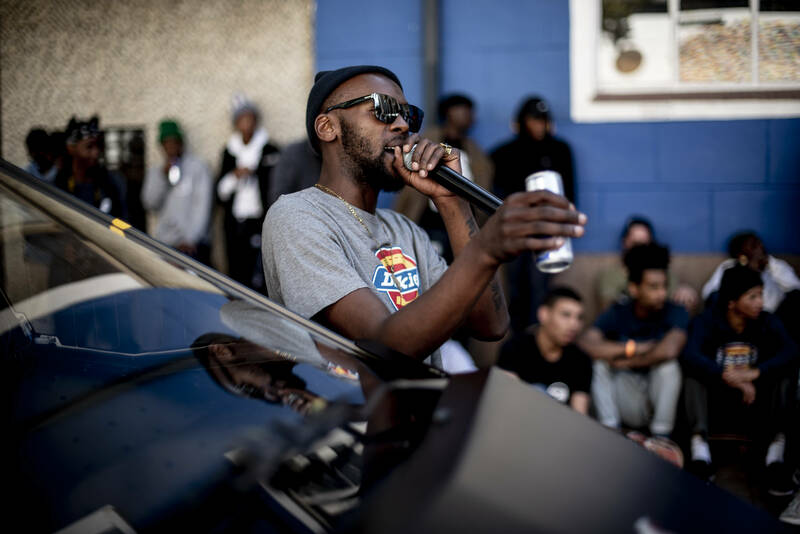 Thanks to Tyrone Bradley and Craig Kolesky for supplying all these images from the event. 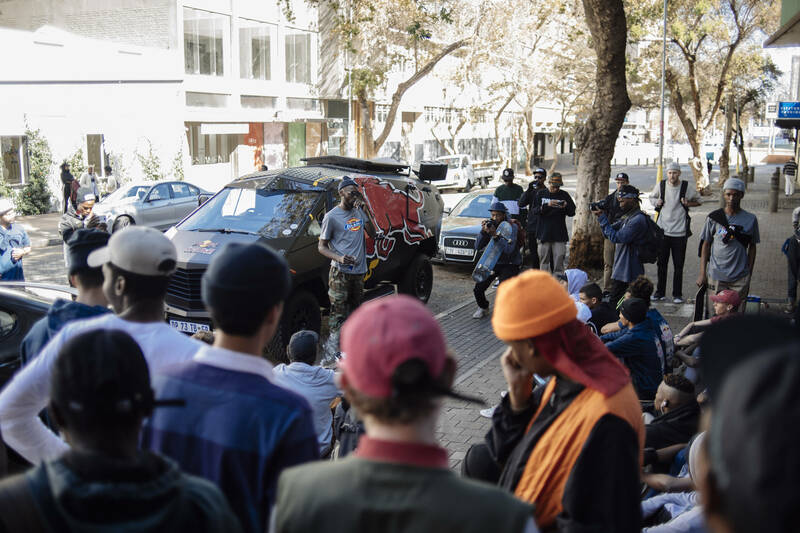 Big thanks to Phiko and everyone at Red Bull ZA for making this epic skate event happen. 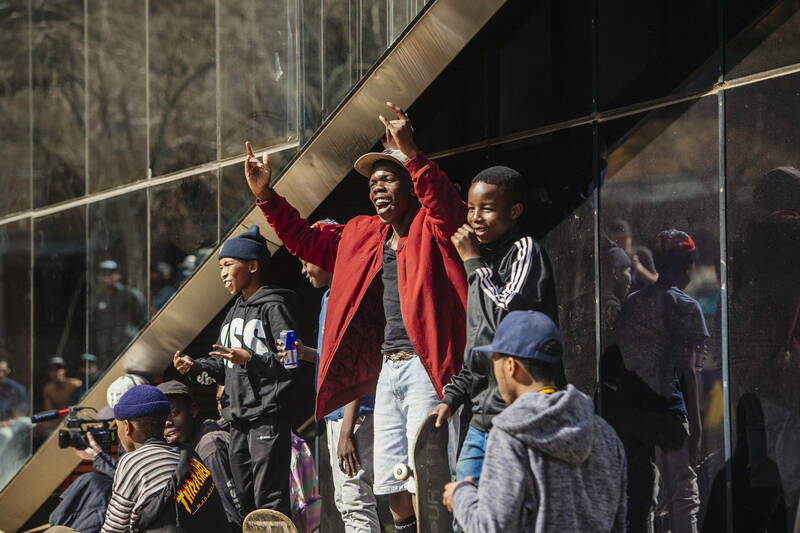 We’re especially hyped that it went down on the streets! Stay tuned for the full event edit coming in a few days.